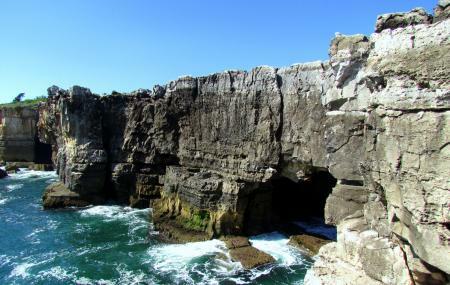 Portuguese for ‘Hell’s Mouth’, Boca do Inferno is a rift formation at one of the seaside cliffs in Cascais. The intense and mysterious name of the chasm and its natural beauty make it a popular tourist attraction. The chasm seen on the cliff of ‘Hell’s Mouth’ is the result of strong water waves crashing onto the cliff surface rapidly and repeatedly. This caused the surface to collapse, giving it a mouth like natural arch. During summer the waters merely make a soothing splash. But in winters, the full force of the Atlantic waves comes crashing onto the cave and is quite a dramatic sight. Legend has it that an evil sorcerer lived in a castle on these cliffs. He abducted a beautiful woman and held her captive in the castle. She was discovered by a man who fell in love with her and helped her escape. The jilted sorcerer unleashed a dreadful storm to destroy the rocks where the women and her beau walked thus causing the large gaping hole. Tourists can take a closer look at Boca do Inferno by climbing down the cliff from one of many designated pathways. Boca do Inferno is also one of the best places to purchase souvenir items. There are stalls close to the cliff site which offer a good deal on many lovely little items. The area has many cafés and restaurant. But if you are not in the mood to sit and dine, you can purchase a nice little snack from the wandering vendors. Boca do Inferno is a 40 minute walk from the town centre. If the waves get too high, the path down to the cliff’s mouth may be closed off for safety purposes. Love this? Explore the entire list of places to visit in Cascais before you plan your trip. Fancy a good night's sleep after a tiring day? Check out where to stay in Cascais and book an accommodation of your choice. How popular is Boca Do Inferno? People normally club together Cascais Old Town and Quinta Da Regaleira And The Inititation Wells while planning their visit to Boca Do Inferno. People also prefer to start their day with Boca Do Inferno. Wonderful place to be.. would say nothing much to see but still enjoyable to see nature at work and how waves keep hitting the rocky sides. Treat to see waves and hear the sound of ocean. There is small market near the spot where shopping can be done for bags, etc.. prices out here were quite economic compared to other places, only catch is that you will need cash as none of those shops accept card. This is totally worth the walk. We went from the town centre and walked through the city then walked along the ocean on the way back. I would highly recommend the visit. It was busy but not to crowded when we went. Gorgeous rock ‘architecture’! This is one of the most western points of Europe and you have the most amazing views over here. Golden tip: come here at sunset for the best views! When we came there were a lot of fisherman and that in combination with the sunset gave an amazing touch, and is just a perfect setting for taking beautiful pictures. Definitely don’t skip this if you are in Cascais!